Creating easy sketches is a nice, gradual way of slipping into the habit of drawing. You could also say they provide excellent warm-up exercises for your fingers. Make a firm decision to take the time to draw or sketch and it does happen - that's the power of determination. You have to take control of your mind and ignore any pressure you feel to be doing other things. You become successful at drawing by first making yourself start and from there it takes only minimum effort to continue. Each sketch on this page took 15 minutes or less, so it's not as though you have to put aside a whole day. I prefer to have a reference picture and then I ask myself a series of questions ... "What is the largest item in the picture? Is that line horizontal or angled? How does the next item measure up with the largest one - is it half the size or what?" This line of questioning is like a diversion and immediately I am no longer fretting about so-called priorities. It's confirmation that this hobby is good for your mental and physical health. I had no idea what I was going to draw next, so I quickly drew a border to form a frame, hoping something would pop into my head. 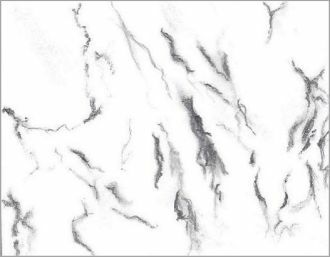 Then I remembered that recently I saw a piece of marble that I thought I'd like to draw one day, so I did my interpretation within that roughly sketched border. It kind of felt similar to creating abstract art. I'm happy I did this drawing but I know now it isn't anything I'll do again. It's not my "thing" and I think it's important to heed my internal guidance. However, I like mixing things up by drawing a variety of topics because I become more aware of my personal likes and dislikes. 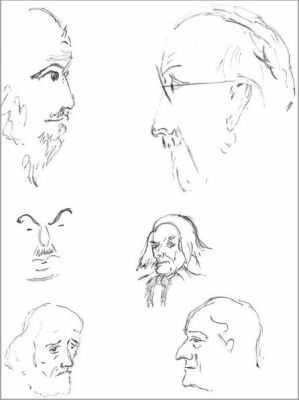 Next, I had a bit of fun copying faces from a book about past artists (Renoir and Degas to name a few) and their quirky ways of representing profiles. This is great sketching practice; by learning how and where to place meaningful lines to create form easily. 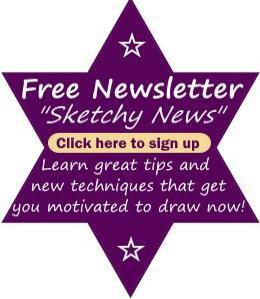 The simple outlines of these easy sketches makes them achievable for anyone. 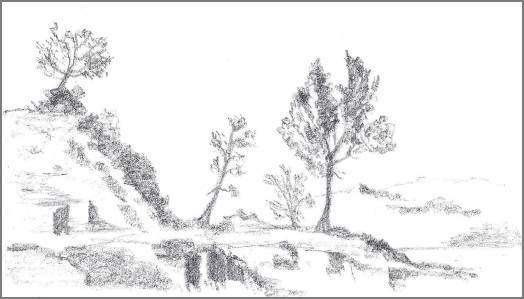 I then decided on doing a landscape and started off with a 2B mechanical pencil to create a rough outline. Ok, now the drawing is started! I didn't like the outline that I initially sketched in, so I changed to an 8B wood pencil and held it side-on. Anything from a 4B to 8B gives similar effects. It really makes quite a difference when you hold your pencil this way. By gripping it further up from the tip, your strokes tend to be loose and light, perfect for forming the basis of an easy sketch. It also prevents you from adding in details too early because you first need to attain a decent resemblance of the original reference picture. One thing I've noticed with my own progression is that I can now hold the pencil in different positions, depending on what I want to draw. Holding it the same way as writing served me well for many years but now I'm really comfortable with changing my grip on a pencil, and all I see is endless opportunities. I still used the original light outline that was already mapped out (shown above) but I drew/glazed over that with the side of the 8B pencil which is darker and softer than a 2B. The foliage on the trees is created with very small lines, sometimes curved or squiggled. I use my imagination to make it look how I think it would appear in the distance. I can create light or dark marks, depending on where I see fit to apply pressure on the pencil. To depict the grass, I slid the graphite haphazardly over the photocopy paper. Wherever I felt the need for something to be added, I swished the pencil over that spot and ta-da, it looked just right most times. If not, I just dragged the pencil to and fro to get what I was looking for. I'm not afraid to erase any bits that look out of place. This easy sketch serves a purpose as a stepping stone to something better. Words don't teach but experience does. This is the truth of drawing. You will get to the place where you want to be but first you must start! Remember that there is no pressure to do everything all at once. So I can now say if it feels right to you, then it is right! Everyone is different so just follow your feelings and you'll get there. Trust yourself. As the saying goes ... "Do the drill to get the thrill!" 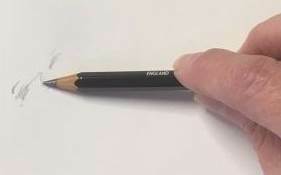 You get into alignment with your pencil as soon as you draw that first stroke. Allow creativity to happen and stop trying so hard! Too often we are inhibited in case we get it wrong. If you try to protect your ego, you won't improve; it's as simple as that. Forget about any restrictions you feel and just enjoy yourself by following your instincts. This is YOUR life, it really is all about you! You can stretch your abilities as far or as little as you like, either way, it is certain that easy sketches like these will give you great satisfaction. Life is meant to be happy and sketching is one surefire way you can achieve that state of being.